Finding surf photography that goes beyond the classic barrel and beach shots is a rare pleasure. 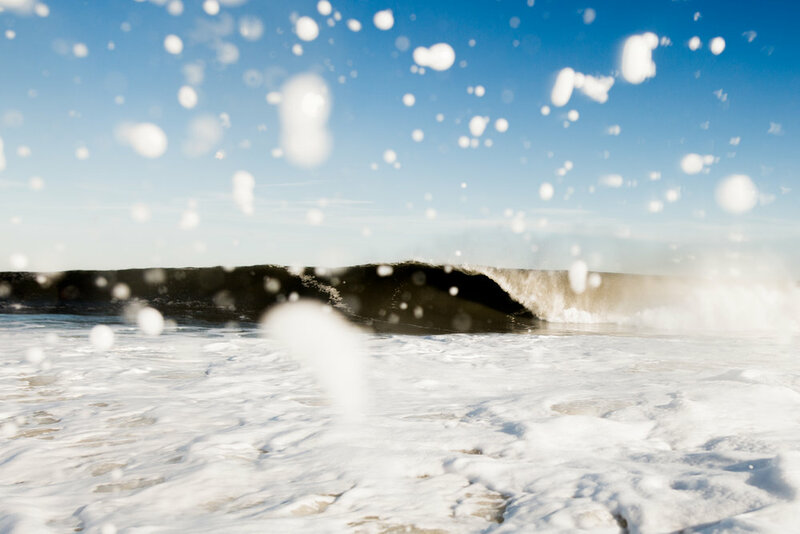 Waves themselves and the act of surfing can be so visually compelling that the bigger story gets lost, but one photographer pushing to find new angles and narratives in New Jersey surfing is Fiona Mullen. We invited Fiona to send us three shots and tell us the stories that led up to each one. We're stoked to share the images and their stories with you here! "On a gloomy day in early June, some of my friends were surfing the jetty down my street. I put on my spring suit for the first time of the season, hopped on my bike, and headed for the beach. While swimming I saw these clouds coming from the distance and knew something crazy was about to happen. Lighting, thunder, hail, and rain all arrived at once. The waves turned on and the few of us that were out there were just amazed by what was going on. Even though it might not have been the biggest day of waves, I still got some of my favorite images ever. The solitude and subtle moments of surfing are what I love to capture the most." "When there's waves in New Jersey, most of us are up at dawn to check the surf. This means endless sunrises, watching the sun rise above the horizon from the water. Every year, there are those select few mornings when the sky does some amazing things. This specific morning while waiting for the tide to change, we experienced the most colorful sky I had ever seen- with a rainbow and even lighting out in the distance. These moments make getting out of bed in those early hours so worth it. Being in the right place at the right time is what its all about. Not everyday in New Jersey is a perfect day for waves or weather, but when those days do come around we appreciate them that much more." "The combination of fear and adrenaline before swimming out on big days like this always makes me question what I am about to do. With three feet of snow on the ground, straight brown water, and perfect barrels, I knew I had to document it. The passion and dedication surfers have in New Jersey is like no other place. People who don't do it think its crazy and most likely they will never understand why we go out in below-freezing temperatures. I think a little bit of craziness and adventure seeking is only healthy; life would be boring without it." To see more of Fiona's work (highly recommended), check out her Instagram. For our updates follow @icecream.headaches.